My 100th movie review since 2011! W00T! The Woman in Black is my favourite novel of all time, and the 1989 adaptation stands tall as one of my favourite films. The 2012 film had me hyped from the very beginning, years before release, yet failed to be the modern adaptation the book deserved in the end. 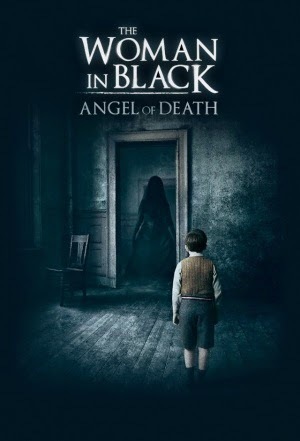 When a strange and unnecessary sequel was announced, the fear of turning my favourite book into a franchise of cliché horror movies made me bitter to say the least; but now that Angel of Death has finally arrived, I can safely say that I am quite surprised at it's outcome. During the Blitz at the peak of World War II, schoolteacher Eve Parkins (Phoebe Fox) and her class of schoolchildren must seek refuge in the long abandoned Eel Marsh House, sitting amongst the lonely marshlands at the end of Nine Lives Causeway, with the help of former pilot Harry Burnstow (Jeremy Irvine). The house remains derelict and unsettling; and as time goes on, Eve notices something is not right, and their worst fears come to fruition as the menacing spectre known as The Woman in Black returns once again. The central issue with the 2012 adaptation was it's lack of a truly chilling vibe, and it was mostly saved by it's stunning production design and solid performances. With Angel of Death, we have a much more unsettling atmosphere and more careful use of jump scares; they're very much in moderation, and less gimmicky than those in it's predecessor. The film also keeps us on edge as things seem to build up to a huge jump, but then we cut away - leaving us unsure as to when the next scare will be, thus making the film less predictable. It's not all perfect, as there are still several annoying jumps (some of which directly recycle ideas from the first film), and the character development this time round isn't as rich. In spite of good performances across the board, some characters simply fall flat, namely several of the insanely annoying children and Jeremy Irvine in a role that the writers seemed to be indecisive over - is he a main character or not? What's his purpose? His focus? His role is seldom developed and thus he feels shoehorned in from the moment he first appears. It's also a shame the musical score prominently rehashes Marco Beltrami's themes from the original, thus making it extremely repetitive and rather lazy. But negativity aside, Angel of Death is definitely an improvement over the first film; not by a large margin, and it's certainly not flawless, but this time round the filmmakers knew how to moderate the jump scares and improve the overall atmosphere. It's therefore a much more absorbing experience, and a surprising outcome for something that looked fairly awful at first glance.